I adore books about Hollywood. I want to live vicariously through the lives of the rich and famous. I really hope this is at BEA! Millions of people witnessed Emma Taylor’s first kiss—a kiss that needed twelve takes and four camera angles to get right. After spending nearly all of her teen years performing on cue, Emma can’t help but wonder if any part of her life is real anymore . . . particularly her relationships. But her new costar, Jake Elliott, couldn’t care less about how many scenes he has to fake his way through; he needs the money. Toss in a reckless heartthrob, desperate for a comeback, and a resident diva who may or may not be as evil as she seems, and the production of Coyote Hills heats up in unexpected—and romantic—ways. 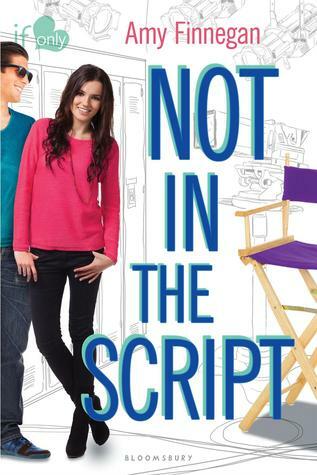 Along with offering front row seats to the real life drama that often unfolds within the entertainment industry, Not in the Script is a story about two not-so-typical teens who are searching for themselves, and just happen to find each other. This looks like a really cute read. I hope you will love it. This one sounds like it has real potential to be a great summer read - I'll have to add this one. Thanks for sharing! I love the sound of this book! Definitely something I would read! Thanks for a great pick! This sounds like an adorable read. Great choice. I really love books about Hollywood too Alison! I think it would be a blast to be on a movie set all day, but I wouldn't want all the other crap that comes along with fame, so I think maybe I'll just stick to working from home and reading about movies instead:) Fantastic pick! I love movie star-themed books too! This one looks fabulous so I'm going to put it on my wishlist. The moment I heard about this, I got SO EXCITED! I love Hollywood and film and all that, so the premise of this makes me super excited! This sounds really good. Hope you enjoy it. Sounds like it could be absolutely adorable. :) Great pick! Cute pick! Doesn't sound like my kind of read, but regardless I hope you enjoy it from cover to cover! Looks good -- not my thing, but I hope you enjoy it! I definitely enjoy living vicariously through books about the rich & famous! Hopefully, it will be at BEA. Sounds amazing! And it comes out on my birthday! WOOHOO!